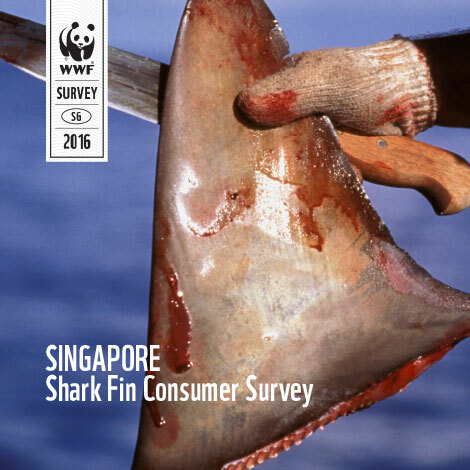 Singapore ~ A consumer survey released today by WWF-Singapore shows that over three-quarters of people surveyed in Singapore want government policy to decrease consumption of shark fin. Other key findings in the report show that over half those asked ate less shark fin in the past 12 months and that 82% think that a shark fin soup alternative would be acceptable at banquets, with the majority opting for a double-boiled soup as a substitute. It also shows that the vast majority are concerned about sharks and over three-quarters would pay more for responsibly fished seafood. “It is clear we are experiencing a cultural change where preservation of our ocean resources and conservation of the shark species is becoming more important to the majority of the public than the traditional value of shark fin soup. It is time for business to step up and match the public’s expectations, stop selling shark fin and support sustainable seafood”, says Elaine Tan, CEO, WWF-Singapore. The governments of Malaysia (2014), China (2013) and Hong Kong (2013) have already imposed banqueting bans preventing shark fin being served at official functions. In 2013 Brunei became the first country to ban the catch and landing of all shark species in its national waters as well as the domestic and international trade in shark fin. “The stage is set for legal action. The Singapore public are already educated on this issue and ready to support policy makers in applying controls to curb the consumption of shark fin here, the vast majority of which is from unsustainable and untraceable sources", Jonn Lu, Regional Director Asia Pacific, Shark Savers. Around 100 million sharks are killed each year for their fins. In 1996 only 15 shark and related species were considered threatened; this has soared by 12 times in only a decade and by 2010 over 180 species were considered threatened. In the absence of sustainably managed shark fisheries the demand for shark fin is putting many shark species under extreme pressure with shark populations unable to replenish at the same rate they are caught.